The Juki HZL-G120 Computerized Sewing and Quilting Machine is a full sized computer-controlled sewing machine with bright LCD Display. 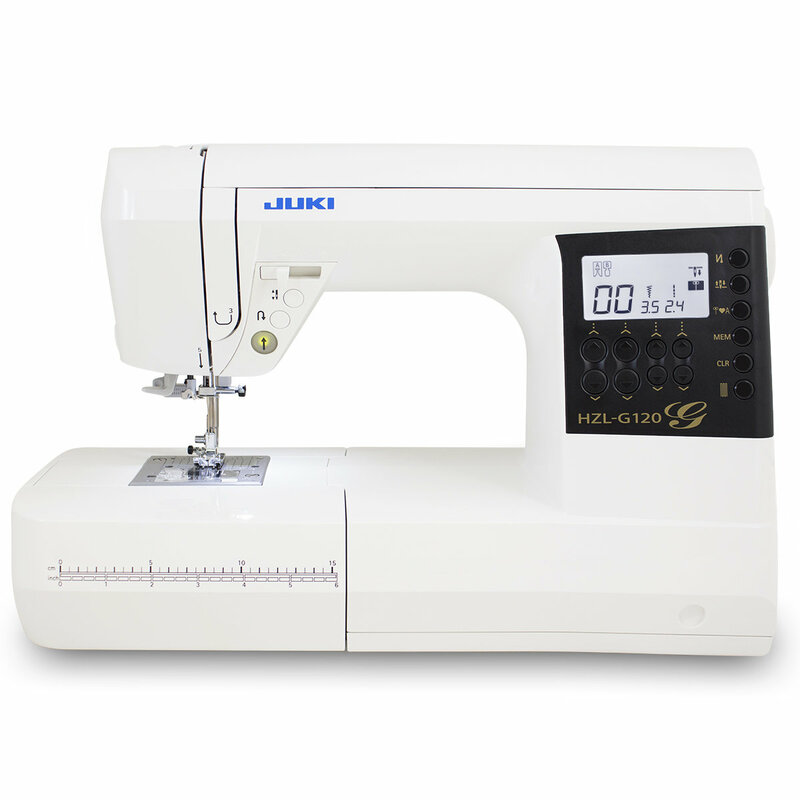 The Juki HZL-G120 will have the strength to sew thicker fabrics with ease. The Juki HZL-G120 Sewing Machine benefits from having the Industrial style Box-Feed system ideal for quilting and sewing a large range of sewing projects. The Juki HZL-G120 is so easy to use it will encourage you to try new creative projects. 180 Stitch Patterns - 22 Practical Patterns, 8 Buttonhole Patterns, 10 Decorative Quilt Patterns, 40 Decorative Patterns. 1 Alphabet including upper & lower case, numbers, punctuation and European characters. In order to provide beautiful seams and outstanding feed performance, JUKI adopted the box feed system. The conventional feed mechanism is oval motion. On the other hand, the box feed moves the feed dog in a box motion. This eliminates material shrinking and shifting. This accurate feeding system provides superior stitch quality for a variety of light to heavy weight fabrics. A thick handle can be sewn with ease. Holding the reverse button will allow you to sew backwards and touching it will lock the end of your sewing. You don't need your foot control to sew. Start and go with the push of a button. TheJuki HZL-G120 has a wide underarm space. It is more enjoyable and comfortable to work with large projects. HZL-G series sews beautiful buttonholes regardless of the type of material. 8 types of high quality buttonhole patterns are available for your needs. The Automatic Needle Threader easily threads the needle without eyestrain and allows you to start sewing quickly, all with just the push of a lever.